#SundaySupper is a group of bloggers who are on a mission to bring back supper around the family table in every home. This week the theme is comfort food. Whenever I think of comfort food I always think of soup. Soup always makes things better. If I have a cold or if I am homesick I want soup. Soup always makes me feel better; always warms my soul. I use to have to go out for soup. But I am working on it. I have been collecting soup recipes and slowly but surely attempting to make them. Some times they are horrible, but lately I have been making some really delicious soup!!! This chicken chowder was lovely! I am a huge fan of chowder. It is right up there next to chicken dumpling for me. I have never cooked with clams and clams are not exactly cheap, especially in the midwest. But chicken, now that is an ingredient I am famillar with! This soup is less salty than clam chowder, but just as rich. I really loved it and will definitely be making it again this winter! This recipe was slightly adapted from Cooking for Two 2012. 1. Cook bacon in saucepan over medium heat until crisp, 5 to 7 minutes. Using slotted spoon, transfer half of bacon to paper towel-lined plate. 2. Add garlic and thyme and cook until fragrant. Stir in flour and cook for a minute or so. 3. Gradually whisk in broth, scraping up any browned bits. Stir in potato and carrot. Nestle chicken into sauce and bring to simmer. Simmer gently, uncovered, for 10 to 15 minutes. Flip half way through cooking. Transfer chicken to plate, let cool slightly, then shred into bite size pieces. 4. Meanwhile, put the chowder on medium heat and add the pepper. Continue to simmer until vegetables are tender, 10 to 15 minutes. After that take the soup off the heat and add the chicken back in and add the cream. Stir until heated through. Stir in parsley, salt and pepper to taste. 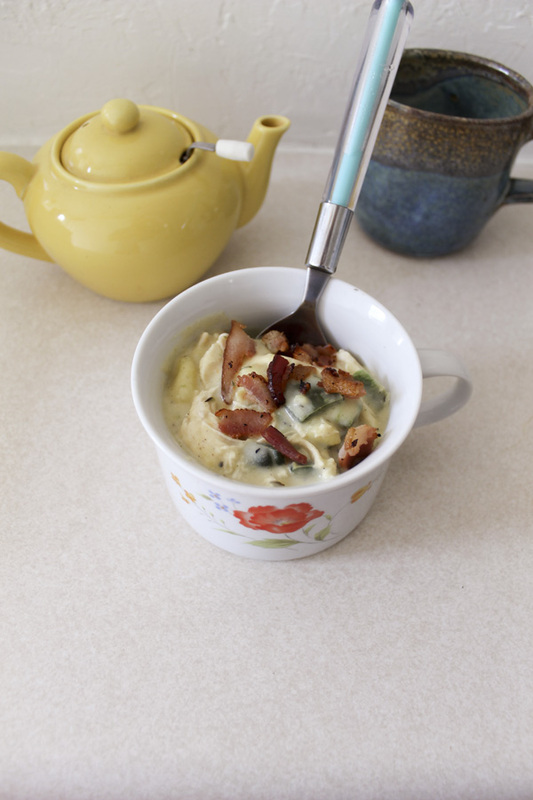 Sprinkle chowder with reserved bacon. We would love to have you join Lee and our Sunday Supper Team during our chat on Sunday at 7pm Eastern Time. Wait till you see the comfort food recipes our talented Sunday Supper Contributors will be featuring. Something tells me, not only will we be surrounded by love and comfort, we will all be drooling. Just look at the gorgeous recipes! If that wasn’t enough, we will also be giving away 5 signed copies of Those We Love Most, all you have to do is share your most memorable comfort food recipes. What a wonderful soup. You cant go wrong with chicken. It is cheap and delicious. The hubbie will love this! I’m officially comforted!! Love me some chowder! Thanks for sharing #SS! What a gorgeous soup! Tough to go wrong with chicken + chowder! My family would love this too! Beautiful soup. My son would love a big bowl of this! I love that you can get that chowder feeling with chicken! So accessible. This looks amazing! Chicken chowder sounds perfect for me – I’m actually not a fan of clam chowder, but I’m always jealous when other people have it…it looks amazing! Anyway, this soup sounds wonderful for a cold day…cozy inside! Bacon, chicken, potato, cream, that would be so good on a cold day by the fire!!! I love a soup with chicken as the meat. Your chicken chowder sounds yummy. Seriously, what could be more comforting than a chowder? Can’t wait to try this recipe. Finally a chowder without clams. This is an amazing recipe, wonderful flavors and easy to make! I love chowda! And the poultry spin spin makes it extra hearty! Yum! Now why didn’t I think of this? Brilliant idea making the chowder with chicken–hubby won’t eat seafood, so clam chowder is out… but I’m certain he’ll eat this! Nice recipe for two. I haven’t had chicken chowder yet…interesting version. Love that you made CHICKEN chowder! Love me some chowder! I bet this would be awesome with some rotisserie chicken too. . yeah? I am sure! I might have to try that next time. Yes, I agree soup makes almost anything better. We all love soup as well, oh yes and chowder. Just had a bowl of clam chowder at the Oregon coast yesterday 🙂 Chicken chowder! What a fantastic idea – your recipe sounds great. I will have to put the recipe on our fall/winter menu and will replace the heavy cream with plain soy creamer to make it Galactosemia safe 🙂 Thank you for sharing! Soup screams comfort! This chowder looks amazing! I’ve never heard of chicken chowder but it looks and sounds amazing! Love this recipe! Chicken chowder is amazing but I have never made it at home. Look forward to trying it out! My dad was a chowder fanatic. He would have loved this. It looks like a big old bowl of comfort to me. This my kind of chowder! I am not a fan of clam chowder, but this sounds amazing! This looks incredibly rich and delicious! Thank you so much for sharing! From all my years of living in New England, I’m a huge chowder (chowdah) fan. I love that you put chicken into yours. What a terrific idea!! 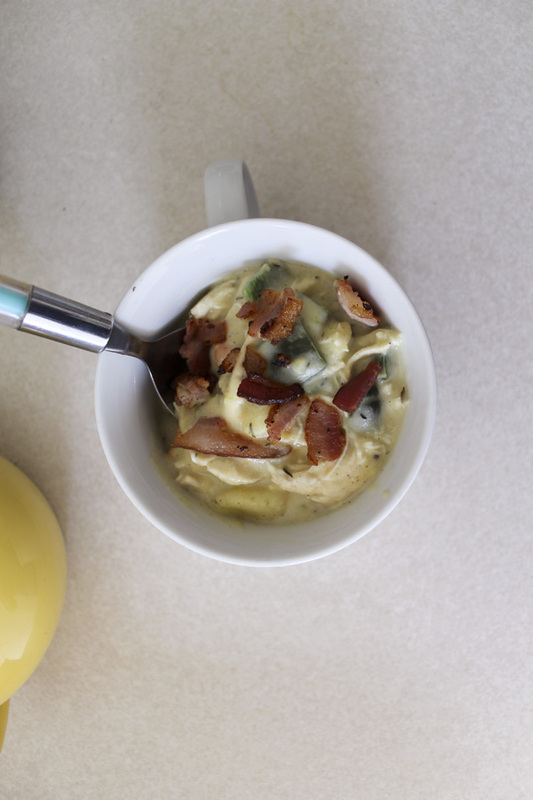 Chicken and bacon in a chowder sounds like the perfect combination to me. What a yummy soup! I love chowder and will definetly be making this! Love that you substituted chicken for clams. Brilliant! I am not a big clam fan so I’d much prefer chicken, sounds delicious!! Love chicken chowder! I bet some corn would be nice in this too! I’ve never had Chicken Chowder before! Always clam, but I’ll have to give this a shot since I do LOVE chicken! I’d love to try this! I always made chicken soup plain, but this sounds delish! I bet the garlic and bacon totally make this! Looks delicious! Yummy ! This is comfort food indeed !